$1420.00 Dollars raised for this years 50/50 drawing to benefit the Elevator & Escalator Safety Foundation. Thank You to everyone that contributed to make this a successful fundraiser. It was great to see so many of the club members on the convention floor. 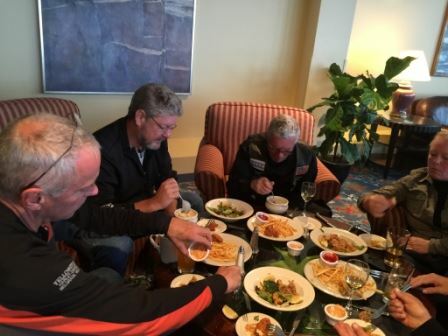 We all are looking forward to our next ride in Grand Rapids Michigan 2019! 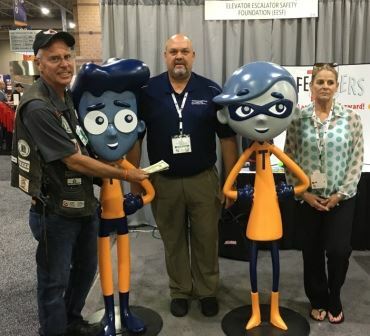 Atlantic City, NJ – On September 25th & 26th, Elevator Riders RC again joined forces in support of the Elevator & Escalator Safety Foundation (EESF) with its 50/50 Drawing. The Sixth Annual Drawing was a success as we had a plenty of tickets taken. The winner was Steve O from GAL of Brooklyn, NY. Steve O gave $300.00 dollars back to the foundation and the remaining $350.00 he donated it to GAL's Red Cross donation of $20,000.00 for Hurricane relief from Harvey & Irma. We wish to Thank all the participates of this years charity 50/50 drawing. Without your support we would not been able to raise money to further the EESF mission. To join the Elevator Riders RC visit www.elevatorriders.com for further information. On August 20th, 2017 members of the ERRC attended the MNM RC Annual Benefit Ride in support of the “The Cancer Support Center”. This is a memorial ride for fallen police officers. Hundreds of riders were in attendance and plenty of sunshine and fun was had by all. 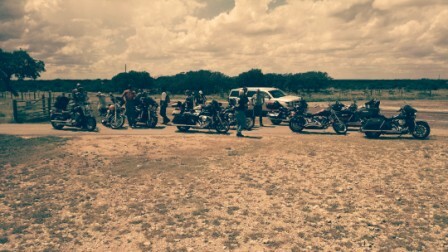 The Benefit Ride raised a considerable amount of money for the center. Very cool that the ERRC members participated in this event in support of a great cause! On August 21st, 2016 members of the ERRC attended the MNM RC Annual Benefit Ride in support of the “Tinley Wish”. This is a memorial ride for fallen police officers. Hundreds of riders were in attendance and plenty of sunshine and fun was had by all. 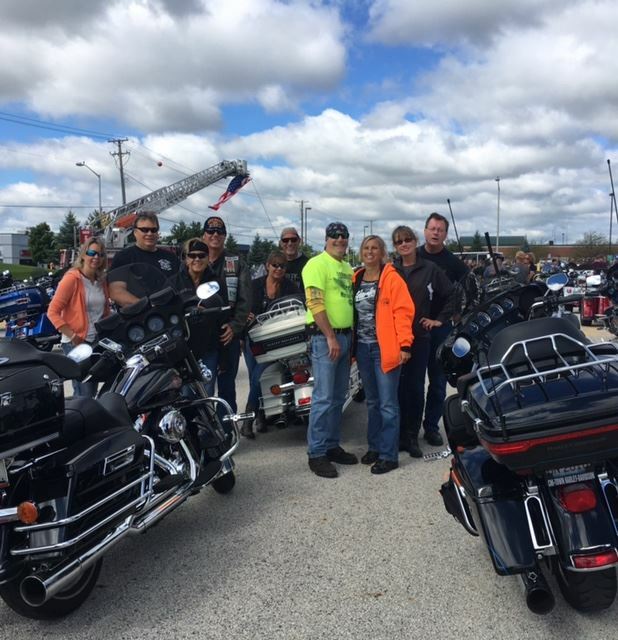 The Benefit Ride raised a considerable amount of money for the Tinley Wish program which helps children and families in need. They reported that they passed the $125,000 mark last year for total contributions to the “Tinley Wish”. Very cool that the ERRC members participated in this event in support of a great cause! The Elevator Riders RC members and guests, rolled thru Massachusetts, New Hampshire, and Maine on Friday and Saturday October 1st and 2nd 2015. 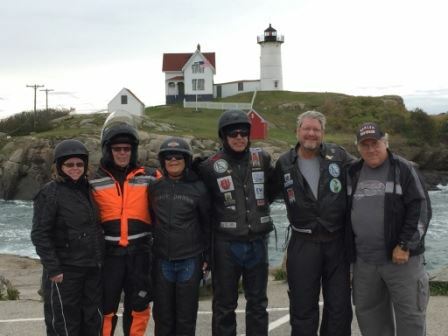 Club members from Illinois, Nebraska, New York, New Jersey, Tennessee, Texas and Massachusetts were to attend this years Club ride. The weather, lets say we had a Hurricane spinning in the Atlantic Ocean that made it less the ideal conditions for our ride. 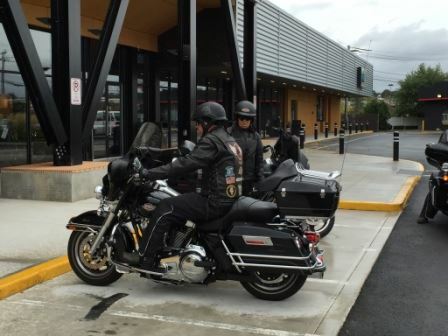 Our tour started at the Boston Harley Davidson dealership. Our first stop was at the beach in New Hampshire. The wind was hollowing the sea was roaring. After a quick cup of hot coffee to warm up, it was off to Maine. The coast line was breath taking. The waves that were coming over the road were not. Cape Neddick lighthouse was a welcome site. From there we could see over the Gulf of Maine and our destination the Cliff House Resort & Spa. 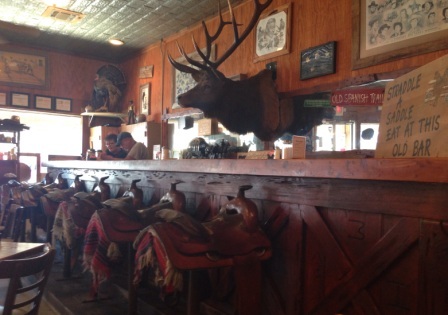 Some very hungry and cold bikers hit the front door of this amazing place. Spectacular can not describe the view. The first order of business was to get warm and of course our favorite beverage. 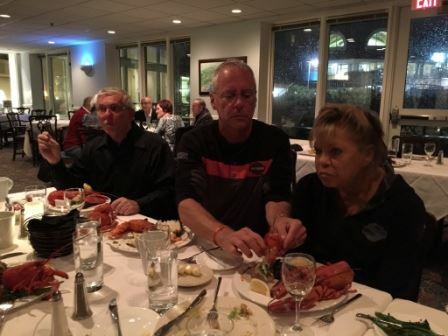 We all had an unbelievable great lobster dinner while sitting back over looking the Gulf of Maine. 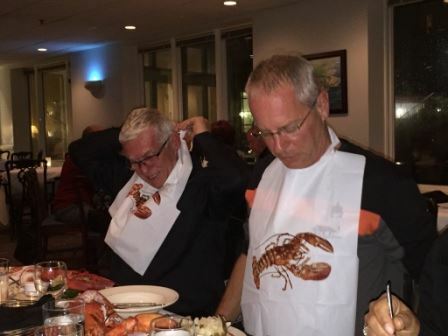 Some of the finest sea food and atmosphere was enjoyed by all, which put us all down for the night. Day two brought not much of a change to the weather. The Hurricane did not move much over night, and continued to punish the coast with some monster waves. Our tour started back heading north to Kennebunkport. We were treated again to some of the most picturesque views of the coast of Maine. We decided to stop in Kennebunkport and check out the vacation home of our past President George Bush. What a place the Bush families have on the coast. 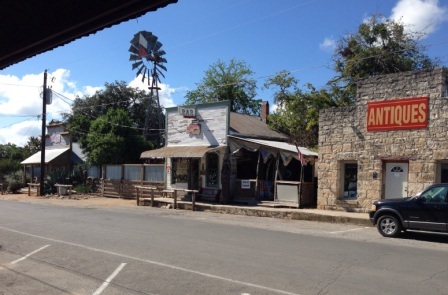 It’s been in the family for over a hundred years, and now it’s become a tourist attraction. I do feel sorry for the neighbors. 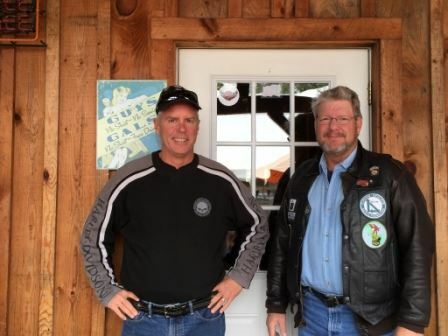 Our lunch stop was to be in Arundel, Maine at a local favorite biker stop. We were not disappointed. This place is a legendary hang out for Biker’s. The atmosphere of this place was truly awesome. We met a local and she told us about this Hog on the table in the other room. She said that George Bush’s grand daughter rode the Hog the past weekend. I asked if that was something anybody can do and she said sure. 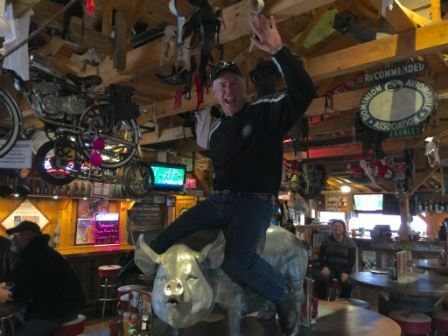 So up on the table I went to ride the Hog. This is another moment that will live forever. 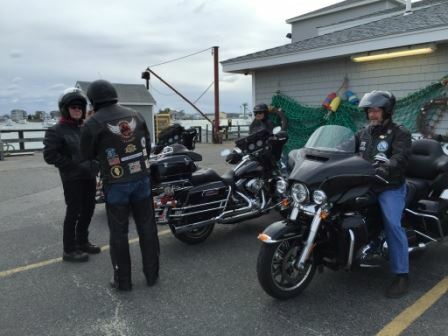 We had some time to enjoy the company of our fellow riders, and a legendary local Maine biker stop. We all hopped on our bikes and rode south towards Boston. 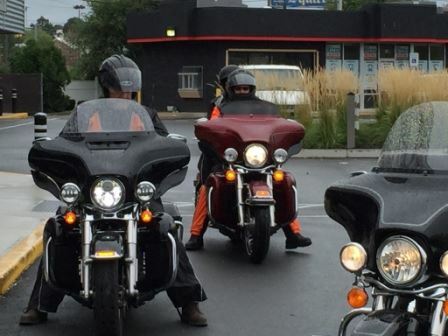 We all stopped for gas and a brief rest before we made our turn and headed back towards Boston Harley Davidson. The two day ride was a lot of fun, and some of the best companionship that anyone could have experienced. When we all come back to Boston, we will definitely tour more of the scenic Atlantic Ocean coast line. Boston is a nice place to spend some time with friends. 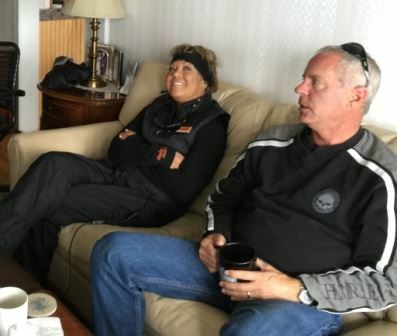 Special Thanks to James Monroe Wire & Cable our Host, and our Ride Captain Bob and his wife Ginny for everything they did to make the trip so memorable. We all look forward to next years ride in Montreal, Canada. We may have to use snowmobiles for the ride, but that’s Ok with me. Ah! Boston, MA – On September 30th & October 1st, Elevator Riders RC again joined forces in support of the Elevator & Escalator Safety Foundation (EESF) with its 50/50 Poker Run. 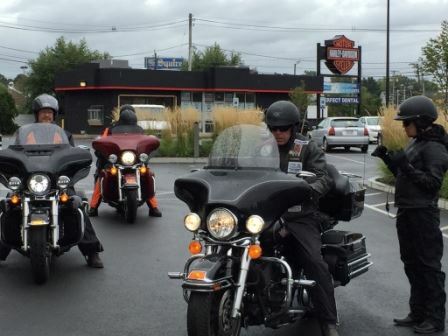 The Fifth Annual Poker Run was a success as we had a plenty of hands played, and many extra playing cards taken. The winning hand was full house Ace’s over Four’s by Walter McNally of Brooklyn, NY. We wish to Thank all the participates of this years charity poker run. Without your support we would not been able to raise money to further the EESF mission. To join the Elevator Riders RC visit www.elevatorriders.comfor further information. 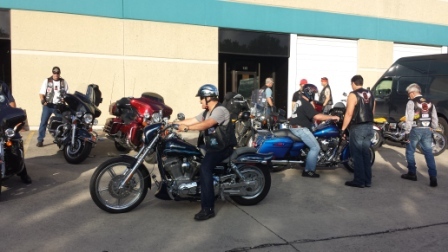 On August 16th, 2015 members of the ERRC attended the MNM RC Annual Benefit Ride in support of the “Tinley Wish”. This is a memorial ride for fallen police officers. Hundreds of riders were in attendance and plenty of sunshine and fun was had by all. 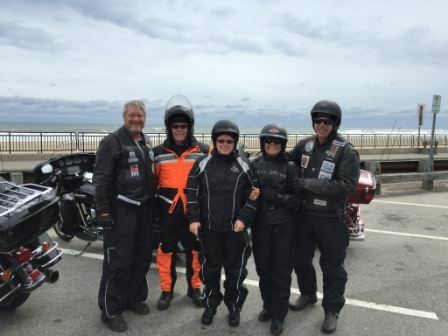 The Benefit Ride raised a considerable amount of money for the Tinley Wish program which helps children and families in need. They reported that they passed the $100,000 mark last year for total contributions to the “Tinley Wish”. Very cool that the ERRC members participated in this event in support of a great cause! I attended the March Annual General Membership Meeting for the Elevator & Escalator Safety Foundation in Tampa, Florida. I arrived on Monday afternoon and Sunshine with 80 degree temperatures was a welcome sight. No bracing for a catastrophic winter storm like last year in Atlanta. I attended the New Board Member Orientation presentation given by the foundations Chairman John Koshak. A thorough overview of the foundations History, Board, Organization, Programs, Financial, and Fund raising were reviewed. The second day we got to work attending to the foundations business at hand in the annual Board meeting. A thorough overview of the foundations Budgets, Financial, Fund raising, and the rebranding of the program were reviewed. The last order of business for the foundation was the swearing in of the new Board members of the foundation. We have a great new group of directors and alternates volunteering to be on the Board of Directors of the foundation.